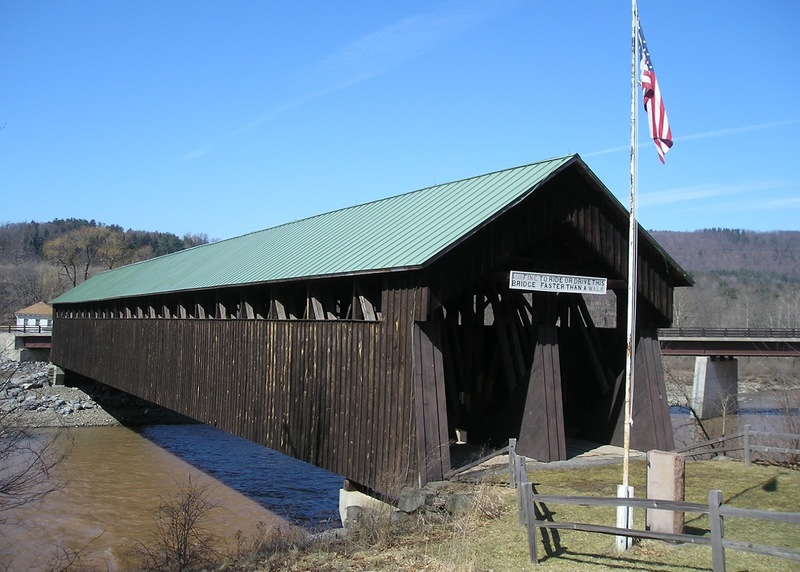 Bridges – old and new – are part of community and state history. The story of three historically significant bridges shows various connections to history. The Blenheim Bridge across the Schoharie Creek in North Blenheim, completed in 1855, was 232 feet long — so long that when it was built, skeptics scoffed it would fall of its own weight. “If the bridge goes down,” said its main builder, “I never want to see the sun rise again!” He did not need to worry. Originally a toll bridge, it served farmers and other travelers for decades, surviving many floods. Its charter expired in 1891 and it was transferred to state ownership. New roads and bridges rendered it obsolete and the state eventually planned to demolish it. In 1931, the county Board of Supervisors voted to retain it as a historic site – the longest single span wooden bridge in the world. Thereafter, it became a tourist attraction and a source of pride for the county. County funds and volunteer efforts preserved it. It was designated a National Historic Landmark in 1964. When a Binghamton attorney offered to buy it in 1970, the board responded that “the bridge is not for sale at any price.” Preserving the bridge reflected county and community historic pride at its best. But on August 28, 2011, the Schoharie Creek, flooded from Hurricane Irene rains, demolished the bridge and swept it downstream. The famous bridge was gone forever. Or was it? The flood overwhelmed the bridge, but it could not wash away the pride and resilience of the people of Schoharie County. As soon as the waters subsided, volunteers fanned out on the creek’s floodplain below the bridge site and began to recover pieces. The work resumed in the spring of 2012. The Blenheim Bridge Recovery Team has its own Facebook page. It has been a community effort, with the county Highway Department, the Old Stone Fort in Schoharie, and others providing support. An April newspaper account described people finding pieces of the bridge sticking out from under deadfalls, buried under tons of debris, and even up in the trees. “We’re pretty pleased with what we’ve recovered so far,” said Blenheim town council member Anne Strauch. “Even just walking out across the fields…there are pieces of the bridge everywhere.” The bridge fits in with a broader vision for the history of the county. “We love the bridge,” said Don Airey, chair of the Blenheim’s long-term recovery committee in June in another news account. “But moreover, we need it. It’s a driver for economic development and a driver for tourism. We believe it could work in conjunction with the other wonderful attractions we have here in the county.” It’s an uphill, against-the-odds story. Airey said the team is making plans for funding reconstruction if enough of the bridge can be recovered. Another possibility might be to build a replica. Schoharie County’s determination is notable. The town of Middleburg, Blenheim’s downstream neighbor and also a victim of the flood, celebrated its 300th anniversary, and its own recovery from Irene’s devastation, early in August. One of the floats was a miniature replica of the Blenheim Bridge. FROM RAILROAD BRIDGE TO TOURIST DESTINATION. Thirty three years after the Blenheim Bridge was built, another technological marvel, a railroad bridge over the Hudson River near Poughkeepsie, opened for service. It was a striking structure over 200 feet above the river, and it served until the decline of the railroads after the mid-20th century and was rendered unusable by a fire in 1974. The derelict bridge seemed headed for demolition. But in 1992, a local not-for-profit group, “Walkway Over the Hudson” was established to provide public access to the bridge. It took over ownership of the bridge in 1998. In 2007, it formed a partnership with a local funding source, Dyson Foundation, with the ambitious goal of making the bridge into the world’s largest pedestrian park. Work began the next year. In 2009, it became Walkway Over the Hudson State Park. At 1.28 miles long, it is the longest, elevated pedestrian bridge in the world. The “Walkway” group continues in active partnership with the state and other groups, including Dutchess County Tourism, Scenic Hudson, and the Hudson Valley Rail Trail. It constantly plans enhancements, including more links to community tourism and historical attractions on both ends of the bridge and a projected Welcome Center and Pavilion. A January 2012 January 2012 study of the Walkway’s economic impact (http://www.walkway.org/images/stories/FINAL-2011Economic_Impact_Analysis_Update-Walkway.pdf) reported over 500,000 visitors annually since the park opened in 2009 — about half of them from beyond Dutchess and Ulster counties where the walkway is located, and 28% from outside of New York State. The net result, according to the report, has been over $24 million in spending in the two counties, 383 new jobs, and $9.4 million in wages. The Town of Lloyd and the City of Poughkeepsie, at the two ends of the Walkway, are both discussing how to rezone and revitalize various corridors to bring in even more visitors according to a recent news report. Thus far, the Walkway seems like an excellent model of state-community-private sector partnership, and a reminder of the economic boost that historic tourism provides. Approximately 58 miles down the Hudson is the Governor Malcolm Wilson Tappan Zee Bridge, carrying the New York State Thruway across the river between South Nyack in Rockland County and Tarrytown in Westchester County. The aging bridge, opened in 1955, is 3.1 miles long – the longest bridge in the state and one of the longest in the country — and carries about 138,000 vehicles a day. The state has developed plans to replace it by 2017. What should be done with the existing bridge? A group of officials and residents, headed by Greenburgh Supervisor Paul Feiner and White Plains Councilwoman Milagros Lecuona, banded together to form the Tappan Bridge Park Alliance to advocate turning the bridge into an “open space park” for pedestrians and bicycles, similar to the Walkway Over the Hudson. It would “generate economic and community development to the region by providing a world-class destination and a much-needed open space in the congested lower Hudson Valley,” said the Alliance in a January 2012 press release. Governor Cuomo expressed interest in February. But Section 23 of the final state environmental impact statement issued on August 1, called that idea not “prudent or feasible.” The conversion and maintenance work would be too costly. The report recommends as an alternative photographing the bridge and distributing copies to the Library of Congress and “other appropriate repositories” and developing “educational materials documenting the history and construction of the bridge which would be made publicly available.” Just what that would mean, and who would be responsible, are not spelled out. Proponents of the conversion of the bridge are discouraged, but have not given up. What will be the Tappan Zee’s place in history? That story is just beginning. Photo of Old Blenheim Bridge courtesy Cg-realms at en.wikipedia. It was NOT Section 23 of the final state environmental impact statement that called that idea not “prudent or feasible.” A Section doesn’t SAY anything. It was a person or persons who wrote that statement. A person with no imagination or passion. Unlike the people of Schoharie County. The bottom line is that people with no imagination and no passion are dead wood. They are not the people who get things done. Many of the 17,000 bridges Bruce cites are being condemned and closed all over the state. I suspect that a high percentage of these will never be rebuilt, so in essence we are rapidly loosing connectivity between communities and social groups that often grew at the ends of bridges…ah, but we can always text one another as we drive the extra miles to get around the condemned bridge.